Data is from the December 2017 KPMG and Mei.com report titled "China's Connected Consumers: The rise of the Millennials" conducted by Ipsos. 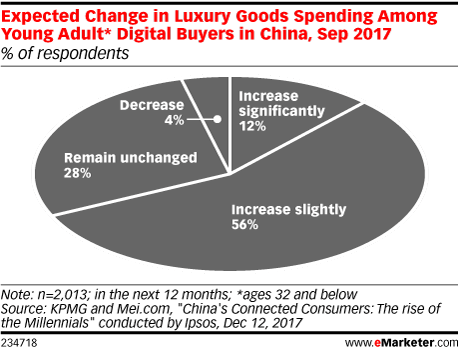 3,004 digital buyers in China were surveyed in September 2017. Respondents were evenly split (33%) among the following age groups: 27 and below (born after 1990), 28-32 (born 1985-1989), and 33+ (born before 1985). Mei.com is a digital retailer of luxury/designer fashion, lifestyle and beauty in China.